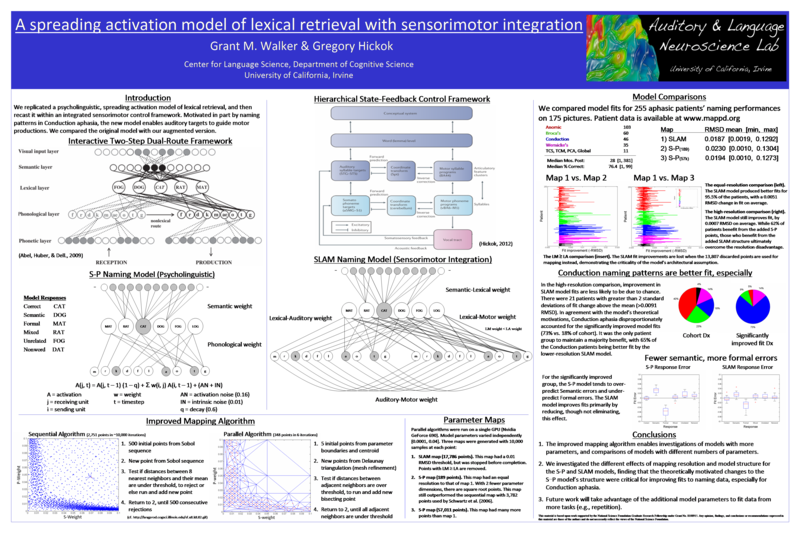 Welcome to Computational Models of Aphasia at the University of California, Irvine's Auditory & Language Neuroscience Lab! This site draws much of its inspiration from the Aphasia Modeling Project. Here you may enter patient data to determine how well our model is able to fit your results, in comparison with a well-established model, or you may run our model directly. The data will be automatically renormalized so that it sums to 1.0. PLEASE NOTE: N is the number of simulated patients, not the number of observed naming attempts. The default value is an estimate of the value that provides an asymptotic average fit, for a group of 255 aphasic patients as a whole, and grouped by 5 subtypes of aphasia. Larger values are more likely to exploit the random effects in the model to improve individual fits. Please modify the parameters you wish, and select Run! To run the SP model, set Lexical-Auditory and Auditory-Motor to 0. There may be a short wait for results. Dell, G. S., Lawler, E. N., Harris, H. D., & Gordon, J. K. (2004). Models of errors of omission in aphasic naming. Cognitive Neuropsychology, 21(2-4), 125-145. Foygel, D., & Dell, G.S. (2000). Models of impaired lexical access in speech production. Journal of Memory and Language, 43, 182-216. Walker, G. M. & Hickok, G. (2016). Bridging computational approaches to speech production: The semantic-lexical-auditory-motor model (SLAM). Psychonomic Bulletin & Review, 23(2), 339-352. Please contact Dr. Greg Hickok or Grant M. Walker for questions or comments regarding the model or the theory behind it. Please contact Grant M. Walker for technical questions about the model's implementation, or to report a problem with this web page. Model fitting sometimes returned SLAM weight values where LM>LA, which violates a constraint of the model. Data fit by SLAM prior to this bug fix should be refit. The Mar 29 2018 bug fix revealed another pre-existing bug. Fit values (RMSD) were incorrectly calculated for the SP model and incorrect parameters were sometimes returned. Data fit by SP prior to Aug 02 2018 should be refit.